The white and brown-dotted fur of the fawns turns out to be a splendid camouflage colouring. Often a fawn lying quietly in the grass remains completely unnoticed by people passing by. When the danger has passed the doe returns quietly and cautiously to the same place again. 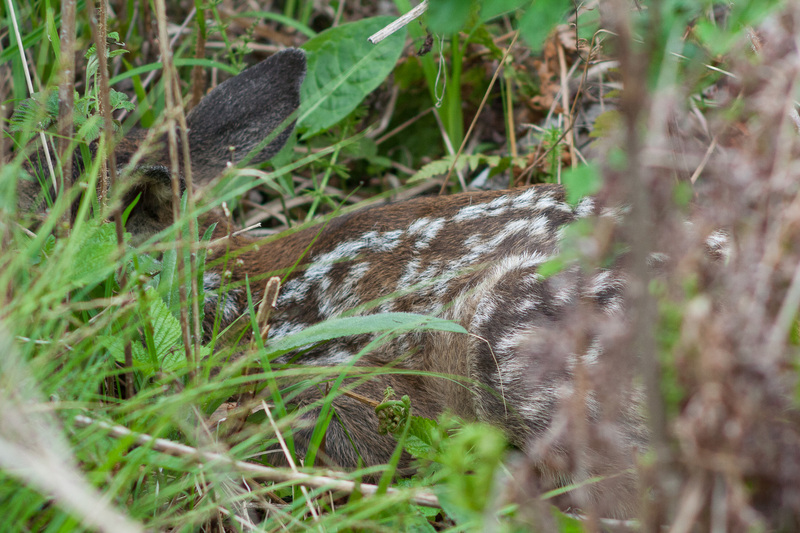 Already at a couple of months the dot pattern becomes duller and the fawns turn reddish-brown-coloured. When the fawns born in spring and early summer are already somewhat bigger but cannot yet run along with the adults they stay in case of danger in the high grass and plants. Later the doe finds them by producing a high-pitched whistling sound and the fawns answer with an even higher pitched whistle. Imitating the same sound hunters attract roe bucks during the roe deer hunting period. The piping for communication with the fawns occurs just in the heat period of roe deer and the bucks will not leave any piping without reacting. The younger the buck the easier it falls into the trap. The old bucks will not be deceived as easily and circle around the whistler until they catch the right scent. If the scent turns out to be wrong the buck flees with terrifying bellows and scolding, scaring people who have come to the forest for berry-picking and mushrooming.